FFGC offers many opportunities to contribute to causes and programs close to your heart. Below you'll find descriptions of available programs and funds. Scroll to the bottom of the page or click here to be taken directly to the donation form below. If you would like to sponsor one of FFGC's awards, please contact Judi Jodoin. Awards to clubs or individuals range from Arbor Day Celebrations to Wildflower Activities. You can choose the award you wish to sponsor. Commemorative Bricks are available to honor an individual, a club, or an event. Bricks are placed along one of the garden paths at headquarters. Bricks are 8" x 4" and can be ordered below with a donation of $50.00 each. Each brick may be engraved with up to 3 lines of text (13 characters per line inluding spaces). Please fill out the Donation Form at the bottom of this page. Questions? Contact our Brick Paths Chairman Joanne Mulinare. 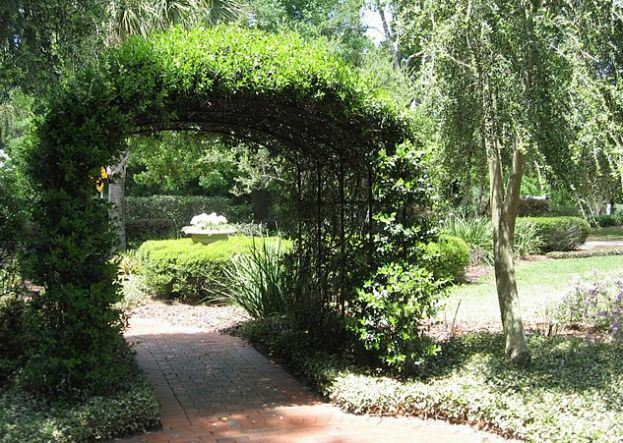 Donations to the Color our Garden Fund contribute to the upkeep of headquarters grounds, particularly the front entrance jasmine and rose garden. The President's Garden is located on the south side of the property. Please contact Grounds Chairman Susan Mello for additional information. Your donation can be conveniently made online by using the form at the bottom of this page. Thank you. Click here to find out how to save food container labels which can be redeemed for much needed youth camp supplies. Since launching a partnership with the U.S. Forest Service in 2004, National Garden Clubs Inc. (NGC) and its various affiliates across the country have collected well over $100,000 on the local and state level for the U.S. Forest Service's well-known Penny Pines program, which is dedicated to replanting damaged forested areas. These funds have benefitted 80 national forests in 42 states. NGC requests that donations be made in multiples of $68. This was the cost of planting 10 acres when the Penny Pines program was first started in California in 1941 as a statewide conservation program, and has been retained as a minimum donation through the years. Please contact Carolyn Schaag to learn more about planned giving. This fund was established during the 1989-91 administration for the purpose of awarding annual scholarships to qualified college students. Donations are tax deductible. Donations of $100 or more are acknowledged in The Florida Gardener magazine and the donor is honored with a certificate at the district meeting. Donations of $1000 or more are acknowledged at the state convention. Contributors of $20,000 or more will have a scholarship named in their honor. Camper fees paid to Wekiva Youth Camp in no way cover the expenses of offering this environmental education program for our youth. Donations to support camp programs, supplies and projects (payable to FFGC – Wekiva Youth Camp) can be mailed to the Wekiva Treasurer or made online below. If a donation is for a specific purpose, please indicate so when sending your donation. A Wish List of current needs is available on the Wekiva Youth Camp website. Donations for UNDESIGNATED Camperships are to be sent to the Wekiva Treasurer.